Optional: any mix-ins you think might be nice. I want to try folding chopped chocolate in sometime. 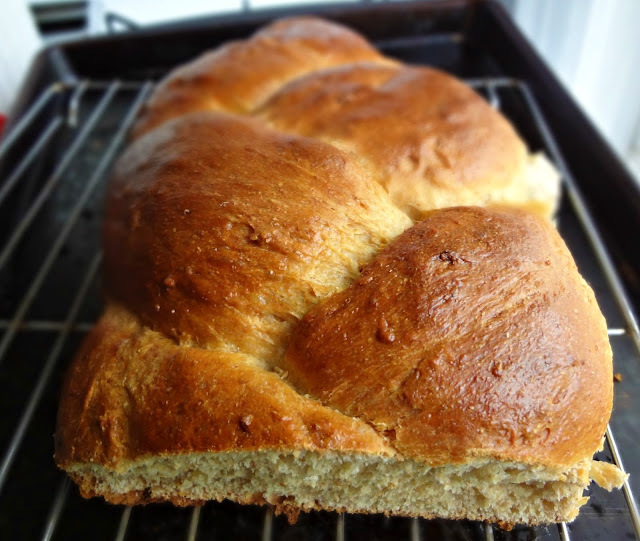 Ruth says: "Raisins, chocolate chips and other additions can be kneaded into the dough, loaves can be topped with poppy seeds, sesame seeds, vanilla sugar or other flavorful sprinklings, and filled challahs can be a lot of fun and very tasty, too! Braiding and shaping, though, become more difficult when the rolled strands have fillings in them." In a large bowl (or in your stand mixer), dissolve yeast in warm water. Let sit 5 minutes until foamy. With paddle attachment (or handheld mixer, or spoon), beat eggs, sugar, butter, and salt into yeast mixture. Then, add in flours and oats. With dough hook, or by hand, knead for 5 to 10 minutes until smooth and elastic, adding flour as/if needed. If kneading by hand, this should take about 10-12 minutes. Form dough into a round ball, oil the bowl and dough slightly, and cover lightly with a towel. Let rise in a warm place for about 2 hours. Once dough has doubled, punch it down. Cover with towel again and allow to rise 30-60 more minutes. Punch the dough down again and divide into 2. Shape each half as desired (3, 4, 6 strand braid, etc.) I used a 3 strand braid-which is just like braiding hair, I think it's the easiest. There's a lot of info. about the symbolism of the braids/strands, etc. You should definitely read up on it! Making strands: There are two basic methods for forming the strands used to braid challah. The first, and easiest, is to simply roll snakes between your hands like when working with clay or play dough. The second method is to use a rolling pin to roll out a flat disc of dough, then using your hands to roll the disc into a snake, rolling the snake on the counter with your fingers to achieve the length you need. This second method does result in a better rise, but either way works well. Whichever method you use, form your strands such that they are thinner at the ends and fuller in the middle. This will help your challah rise in the center. What my formed loaves looked like pre-rising. Place shaped loaves onto parchment covered baking sheet(s). Cover with towel and let rise for an hour. Bake 25-40 minutes, until the loaf sounds hollow when tapped on the bottom. 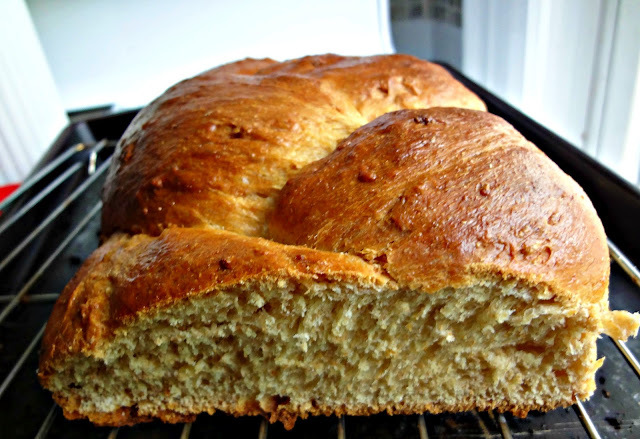 Check back tomorrow to see what delicious dessert I made using this bread! Holla! 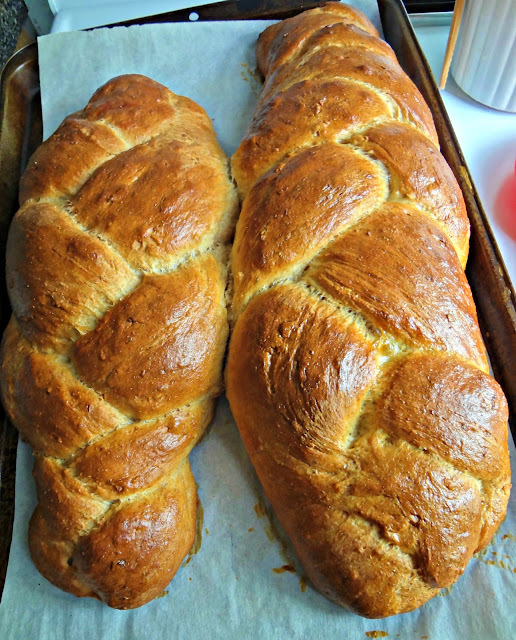 Your Challah looks amazing! hahaha omg I love that you too speak baby talk to each other, my best friend and her boyfriend used to do it all the time and it drove me NUTS! Super yummy looking challah bread though darling! That braid is PERFECT! Can't wait to check out your dessert! Mmmmm bread is something that I need to get cracking on and LEARN...And I always think baby talk is hilarious. Every night I give a nice "I wub joo!" to everyone! Awesome job! Your challah looks so great!! This looks so good! 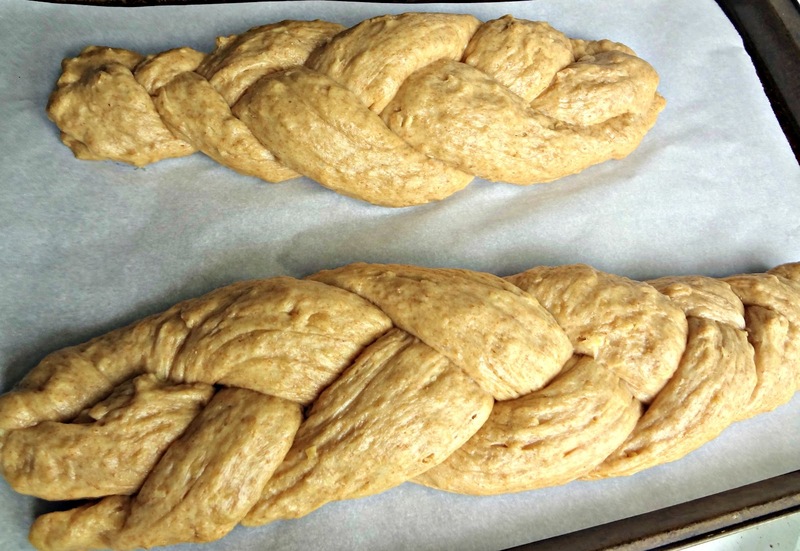 I love plaited bread; a little extra effort goes along way. LOL at the baby talk!! Yeah my bf and I do it all the time too and my friends would want to puke upon hearing it (by accident, or not lol) Good job on making it so healthy and wholesome! The braiding part was my favourite! I've been braiding hair since I was a little kid and this was totally up my alley! lol! I'm shuuure your challah was vewy vewyy tasteee! Haha I love that you can get addicted to this - looks like I must give it a go! Beautifully done! I should have come out of Daring Bakers' retirement for this one...YUM! I haven't seen whole wheat challah before. I love challah French toast. You are so right. It is the BEST! I've never seen whole wheat challah! What a great idea. Your photos are gorgeous of the bread. 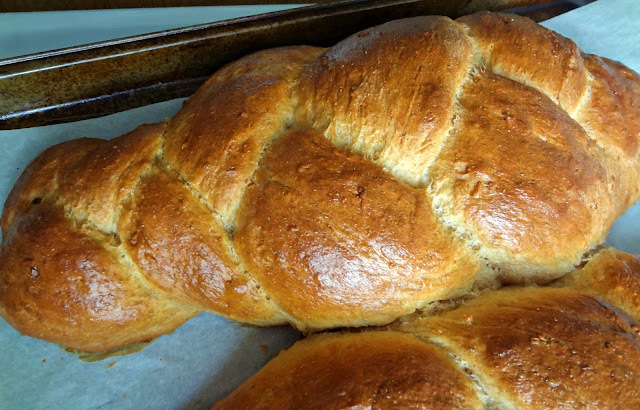 I've never made challah before, but love it so much I'm going to give your whole wheat recipe a go. Thanks for posting this!! You did a great job! And yes, challah absolutely makes the ultimate French toast!